At the Gates of Loyang is the immediate predecessor to Agricola. After each harvest, you as framers meet at the gates of Loyang to trade your produce. You make deliveries to your regular customers and sell vegetables to casual customers for lucrative profit. But vegetables can also be bartered at market stalls or used as seed to plant new fields. Helpers, each with different skills are available to assist you in your strategies and tactics. 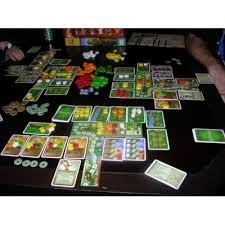 A game of At the Gates of Loyang is an agriculture game played over 9 rounds with 3 phases per round. Players will plant their fields, harvest and sell their produce to two kinds of customers, casual and regulars. Regular customers demand shipments each round. Casual customers are a one-time buy. Your customers provide your income in which you use to purchase victory points on the Path of Prosperity track. The most successful farmer will be the one who makes the most progress on the Path of Prosperity. 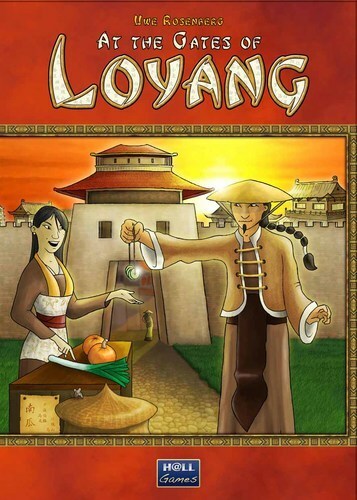 We have an open copy of At the Gates of Loyang available in our Store Demo Library for you come in and try out.